Compare the latest prices and discounts on Chilean wines. Use various search filters, follow reviews, awards and Price History to get all the information you need to make the best buy. 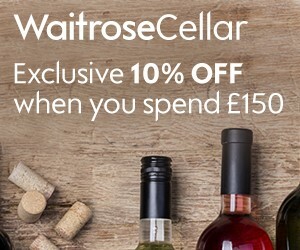 Sign up to Price Alerts to never miss a deal on your favourite bottle. 10% off promotion code ends midnight 2nd May 2019. Minimum spend as stated applies, maximum £50 discount. Promotion code cannot be used in conjunction with any other promotion codes. Online only at waitrosecellar.com. Excludes En Primeur lines. Subject to availability. Not applicable in branch, concessions or Welcome Break. Customers must be at least 18 years of age. Chilean wine burst onto the scene in the UK in the early nineties, on the cusp of the New World wave, originally created by Australia. Chile brought to the market superb value, reliability, well- known grape varieties, and fruity, approachable wines, mainly from grape varieties that were known and recognizable. Whilst Chile has a very long wine-making history, dating back to the 16th century, it was really only in the 1980s, that the Chilean wine industry had a revival, partly due to the influx of foreign investors and heavy winery investment, following the establishment of a new period of post Pinochet political and economic stability. New, high tech wineries, investment into vineyards, and a new breed of winemakers, many of whom had learnt their craft in France and Australia, helped establish the modern day Chilean wine industry, and drive its early success. In 1995, there were less than 20 properly established wineries in Chile; today there are over 300 exporters, including a clutch of major multinational brand owners, who dominate the market, including Concha y Toro, Santa Rita and Vina San Pedro. Chile is now the world’s 9th largest wine producer, and the 5th largest exporter of wine. Although the majority of the producers now export, over 50% of total exports are controlled by just 10 wineries. With over two thirds of its wine production exported, one of the risks for Chile is the exchange rate factor – since most of its income is in dollars, but most of its costs in pesos, the weak dollar has, at time, squeezed margins, and put more pressure on pricing. Chile established itself initially as a provider of superb, easy drinking wines, at value for money prices; now its push is to increase the average price point and build awareness and sales for its more premium, regional wines. Winemaking was introduced to Chile in the 16th century, by catholic missionaries, with vines brought in from Spain, Peru and California. For centuries, the majority of the production was sweet, high alcohol wines, made from the Pais grape, which until the 21st century, was the most planted grape variety in Chile. Pais is also responsible for the production of Chile’s national drink, Pisco, a grape brandy, made into the national cocktail ‘Pisco Sour’. Much of Chile’s early wine legacy is owed to France; rich landowners, on their travels to France and Europe, were impressed by the wines and vineyards they saw, and began to bring back plantings of French vines – including the grape varieties that now form the backbone of the Chilean wine industry, Cabernet Sauvignon, Merlot, Chardonnay and Sauvignon Blanc. The Errazuriz family were the first ones to spot the real potential for wine production on a quality scale, setting up Errazuriz wines in 1870 and bringing in a French oenologist to oversee wine production. The political regime, which controlled the country until the seventies, restricted the development potential of the wine industry on an international scale, and it was only in the 80s that the modern Chilean wine industry began to emerge. Chile has often been described as having ‘the perfect climate and location’ for grape growing. With 14 separate wine growing regions, the most northern and southern vineyards are separated by about 1000km, spreading north and south of Santiago, through this thin strip of country, which borders the Andes and Argentina on one side and the Pacific Ocean on the other. The most northern vineyards of Elqui are located up in the Atacama region, close to the desertland reaching up towards Bolivia and Peru; the most southern, Malleco spreads down towards the cool climate region of Patagonia. The climate throughout Chile is varied, but dominated totally by the influence of both the cooling breezes from the Pacific ocean, and also the protective influence of the Andes mountains. Chilean vineyard owners rely on irrigation for the vineyards, much of which comes from the melting snow on the towering Andes mountains. Whilst the latitude of the vine growing regions equates to those between southern Spain and North Africa, the temperature is milder, and is often described as being a cross between Bordeaux and California growing conditions. Grape varieties are largely the international ones, due largely to the 19th century influence from Bordeaux, but the grape that is viewed these days as Chile’s own, is the Carmenere, a dark skinned grape, originally from Bordeaux, which was pretty much killed off by phylloxera, but rediscovered in Chile in the 80s. One point to note, that although many of the world’s vineyards, including California, were blighted by phylloxera, the combination of the Andes and the neighbouring Pacific ocean seemed to protect Chile, with the result that the vines in Chile are phylloxera free and ungrafted. The wine regions of Chile stretch in a thin band north and south of Santiago. The regions differ widely in terms of soil structure, climate and therefore types of grapes grown and styles of wine made. Starting in the north, lies the Atacama region, a hot arid place, which is the driest desert in the world. It is only very close to the coast, that it is possible to grow grapes, and these are generally used for the national spirit, Pisco, a grape brandy. Click on the links to dedicated pages to read the full guide on the corresponding region or sub-region. The Elqui valley lies 29 degrees south in latitude, one of the closest regions in the world to the equator, just south of the desert, and it is common to see cactus plants growing amongst the vines. Until the 90s it was a region not known for its wines, with the majority of the grapes being used for Pisco Sour. However pioneering winemakers, such as Italian Giorgio Flessati, of Vina Falernia, realised the potential for quality grape growing on the higher slopes of the valleys that stretch across this region, where there is sufficient mountain water, and sufficient altitude to permit cool nocturnal temperatures and optimum grape growing conditions, ensuring liveliness and acidity in the wines. The soils in the hills are gravelly, whilst those close to the coast are more clay based, and more suited to red wines. Elqui valley produces some intense powerful Carmenere, Cabernet and Syrah wines, and some lively juicy Merlot and Sangiovese, but it is for the remarkably fresh whites for which the region is becoming well known; Chardonnay and Sauvignon blanc work well here, but there is also some deliciously fruity and vibrant aromatic dry white from the Pedro Ximenez, the traditional grape used in the production of Pisco. This is a small valley, 400km north of Santiago, in one of the narrowest strips of land – there are no wine producers there yet, but Cabernet Sauvignon and Syrah is being grown there, so it’s an area to watch. The region of Curico lies about 200km south of Santiago, and is at the heart of the Chilean wine culture, with vinegrowing, the main agricultural business. Lying further south, and further away from the equator, it has a cooler climate than the more northern Central Valley locations, and produces wine from over 30 different varieties. Curico is historically the birthplace of the modern era for Chilean wine production, since it was here that Miguel Torres set up his vineyards and winery in the late 1970s, opening the floodgates to the overseas investment and expansion that was to happen. Curico is home to some of the best known names in Chilean wine, as well as Torres – San Pedro, Montes, and Valdivieso to name but a few. Curico is known for producing great value wines, in large quantities; it may lack the star status and complexity of regions such as Casablanca and Colchagua, but it provides a vast quantity of extremely good and reliable quality wine, including many of the big brand blends. Sauvignon Blanc is strong here, producing a grassier, herbaceous style, with the main reds coming from Cabernet Sauvignon and Carmenere. There has been a great deal of development in the Southern section of Chile in the last 10 years especially, as winemakers explore the possibilities and opportunities of these cooler climate areas. The Itata valley is one such area; it runs approximately 100km from north to south, relatively close to the southern town of Concepcion, and 250km south of Santiago. With higher rainfall, a more exposed location, generally cooler climate, and based on clay and alluvial soils, it is a region where new vineyards are springing up, alongside the traditional bush vines. Whilst no particular grape variety has been identified as the star of the region, increasingly high quality wines are being produced from Chardonnay, Cabernet Sauvignon and Merlot. This is without doubt one of the most exciting, new development areas in Chile. With its southerly location, it has much higher rainfall, cold nights and a longer growing season that many of the more northern regions and lends itself perfectly to the production of aromatic whites, and the temperamental Pinot Noir. When the revival of the Chilean wine industry first began in the 1980s, this area was still very much just a region which produced Pais, however it has been spotted as a wine region of great potential in recent years, and there is a considerable amount of investment and new vineyard plantings in the region. Sauvignon Blanc, Viognier, Riesling, Gewurztraminer and Pinot Noir are the grape varieties that are showing the most promising signs at this stage, and this is definitely a quality wine region to watch over the next few years. At present, this is the most southern of Chile’s wine regions, although experimentation is happening even further south near Osorno. Like its neighbour Bio-Bio, this region is very much cooler and continental than the other wine regions of Chile, with higher rainfall, and greater risk of frost. To date the most successful grape varieties are the Burgundian pair, Chardonnay and Pinot Noir. The relatively recent development of, and investment in the Chilean wine industry has led to the plantings of many international grape varieties, and it is these that dominate in Chile, ranging from Bordeaux and Rhone classics, through to the cooler climate aromatics from Germany. However Chile has one grape, which it has really made its own, almost ‘national’ grape, the Carmenere. Chardonnay loves the climate and soil types of Chile and produces some stunning wines, both oaked and increasingly unoaked. It is grown across the country, but performs best in some of the cooler climate areas, such as Bio-Bio and the region, where it truly stars, Casablanca and the Leyda Valley. Styles vary greatly, from the more traditional oak aged styles in the central valley, to the new wave, of vibrant, fresh, often unoaked, or lightly oaked styles made in Casablanca, Bio-Bio and other cool climate areas. The oaked styles are rich, bold, full of toasty, tropical fruit, and a creamy vanilla edge; the newer, fresher styles, celebrate the pure fruit quality, with lively, citrus-streaked white peach, creamy fruit, and have a distinctive streak of minerality and zest. Food matching ideas: Rich fish dishes (salmon, creamy fish pie), buttery roast chicken, pork in a creamy sauce, brie and other soft cheeses. Lighter, zippier styles: lightly spiced dishes, seafood. Sauvignon Blanc has turned into one of Chile’s biggest success stories, and is perfectly suited to the cooler climate areas. Grown at altitude in the north, by the coast in the Casablanca area, and in the cool south, it produces whites which provide a viable alternative to those sauvignon Blanc drinkers who want to explore further than New Zealand. The style is different, and slightly tighter and edgy, but less herbaceous and grassy than many South African versions, producing, verdant, fresh, zesty whites, with a ripe, tropical edge and delicious citrussy character. Food matching ideas: seafood, pan-fried fish, zingy green salads or goats cheese salad, asparagus, Thai and Chinese dishes, mild Indian curries. The native grape of Germany and Alsace, Riesling is perfectly suited to some of Chile’s coolest climate wine growing regions, producing seriously good wines from the southern regions of Bio Bio, and also some up in the Casablanca area - full of lemon zest, pungent, floral character, with a twist of lime and a minerally, pure fruit freshness. Food matching ideas: dishes with powerful flavours: smoked fish dishes, spicy Indian curries and marinades, Thai chicken curry, fruit-infused meat dishes (roast pork with gooseberries, north African fruity tagines), rich washed rind cheeses. The ripe, minty, blackcurrant characteristics of the Cabernet Sauvignon grape, are showcased to perfection in the central regions of Chile, where the climate and topography permit the grape to come to full ripeness. In the warmer regions, it produces top quality reds, full of intensity, complexity and longevity, with rich, intense flavours. Some Cabernet is now being grown in some of the cooler regions, where the style is edgier, with a herbaceous, restrained style. It stars on its own, but is also frequently partnered with the national Chilean grape Carmenere, producing bold, spicy, powerfully rich styles of red. Food matching ideas: roast lamb, roast beef, steak, rich lamb and beef stews, venison, oriental dishes, cheddar. Considered the national grape of Chile, this dark-skinned grape is grown in most wine regions, but performs best in the hot climate of the central regions, since it requires sun, heat and a long ripening period for it to ripen fully. If not fully ripe, the wines have a tendency to a grassy, sappy character, but well made, they are rich, spicy, and attractive, full of scented, violet aromas, with warm blackberry, black pepper and dark chocolate character, with soft tannins. Food matching ideas: barbecues, roasts and steaks, curries and other spicy oriental red meat and vegetarian dishes. Shiraz, or Syrah, as it is still frequently labelled in Chile, is grown increasingly in the central valley region, producing rich, powerful, spicy wines for ageing, with dense fruit and an intense structure. It is also used in blends with either Cabernet, or Carmenere, giving spicy, rich, ripe, plum and mocha styles of wine. Food matching ideas: seared steak, barbecues, hefty stews, spiced roast lamb, Indian red meat dishes, cheddar. One of the classic grape varieties in traditional Bordeaux blends, the Merlot grape is extremely well suited to Chile, with its hot, sunny climate – the only danger is that the Merlot is an early-ripening variety, so needs to be picked relatively early, before the grapes over ripen. It’s rich, chocolatey, plummy, early-ripening fruit make for deliciously ripe, intense, velvety reds. Food matching ideas: spicy food, rich, naturally sweet, meaty stews, meaty pasta, everyday dishes (shepherd’s pie, sausage and mash), spicy Indian food, Mexican fajitas. Chile is a natural home for Pinot Noir, where it is thriving and producing world class wines in the cooler regions. The climate, soils and topography suit the temperamental and delicate nature of the grape. The very hot climate of the Central Valley does not suit this sensitive and temperamental grape variety, but a focus on the cool climate areas for this grape variety have resulted in some extraordinary wines, from Casablanca, Leyda Valley, Bio-Bio and other higher altitude cool regions; these wines are world class, and have all the vibrant, nervy, pure elegance of Pinot Noir at its best. Elegant and perfumed, these wines have a softness, yet a rich silkiness of fruit – gentle tannins, and rich, raspberry fruit flavours, together with a sublime elegance and generosity of fruit – probably the most seductive of all red wines. Food matching ideas: most game (duck, pheasant, venison etc. ), Asian red meat dishes, aged soft cheeses. Tempranillo – this classic Spanish grape is doing well in Chile, with its ripe, soft, yet full on, red berry fruit style, and a vanilla, mocha edge.